Move over Nissan LEAF, the Coda electric sedan is here, and it has a more reliable, longer range, Coda CEO Kevin Czinger told us in an interview last week. Read our extended story on the startup’s big plans, goals and financing under way here, but if you want to check out our actual test drive of the Coda electric sedan click below. (Note: Unfortunately the audio on Czinger’s mike turned out a little crackly — “hot” as they say — so we kept the clip short). The sedan will likely be priced in the low to mid thirty thousand dollar range after subsidies and it’s meant to be a practical car for a mainstream driver — albeit the early-adopter, EV-friendly mainstream driver. 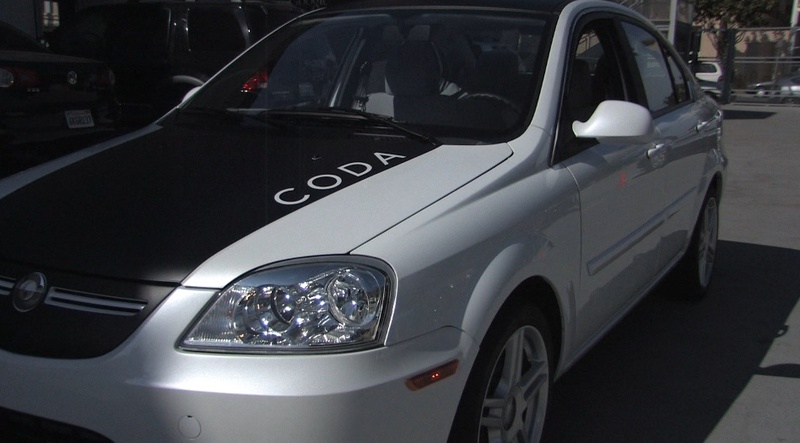 Driving in the back of the Coda sedan reminded me of driving around in my trusty Honda Accord (before I sold it), with a few new car luxury perks, like its rotary dial gear shift and fancy driver screen. It’s an EV for the everyday man. And, like all EVs, its got that 100 percent torque, basically instant acceleration. It’s not perfect quality audio, but certainly good enough to hear what he was saying. It would be cool to see a longer version to get a better sense of what the car is like to drive. Thanks for the comment! I’m Darryll Harrison, part of the Product Communications team here at CODA. The CODA Sedan will actually feature room for 5 passengers and a full-size trunk. So a family of 5 can all ride in the car, along with their “stuff.” I hope that helps clarify! More information about pricing and other updates coming very soon. Hey Andrew, thanks for the comment! My name is Darryll Harrison on the Product Communications team here at CODA. Just to clarify, the CODA Sedan actually has seating for 5 passengers plus a full-size trunk so families will have plenty of room for them and their stuff. Looks like a nice vehicle! Hopefully Coda will indeed price it competitively. For us as a family, the dealbreaker is that it only seats four, while the LEAF seats five. But still, this vehicle should appeal to plenty of EV buyers.